Any study of the Muramasa Kei (村正派) would be somewhat remiss if it did not start with a bit of historical lore. 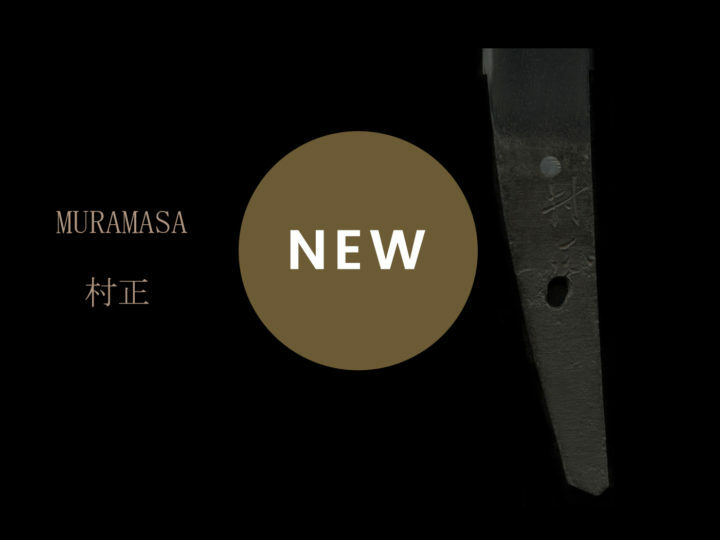 For hundreds of years the swords of Muramasa (村正) have been regarded as bad swords with evil powers. When we say “bad swords’ we are not speaking in a qualitative sense, but rather in their supposed ability to cause bad things to happen to their owners. This is contra to what we are taught about swords in that historically they have been thought to have been divine objects derived from the elements of fire, water, iron, wood and earth. It is generally considered that the story about the evil swords of Muramasa (村正) originated during the Edo Jidai and was born because of ill fortune mysteriously piled upon the Tokugawa family. The grandfather of Ieyasu (家康), Jirôsaburô Kiyoyasu (清康), was slain at the young age of 25 by a katana made by Muramasa (村正). 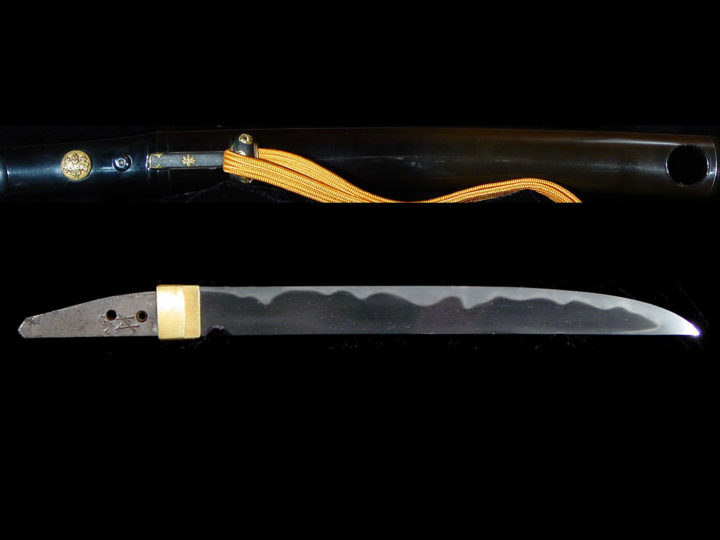 His son, Nobuyasu (信康), who was Ieyasu’s (家康) uncle, also received a serious sword cut at the hands of a drunk with a wakizashi made by Muramasa (村正). 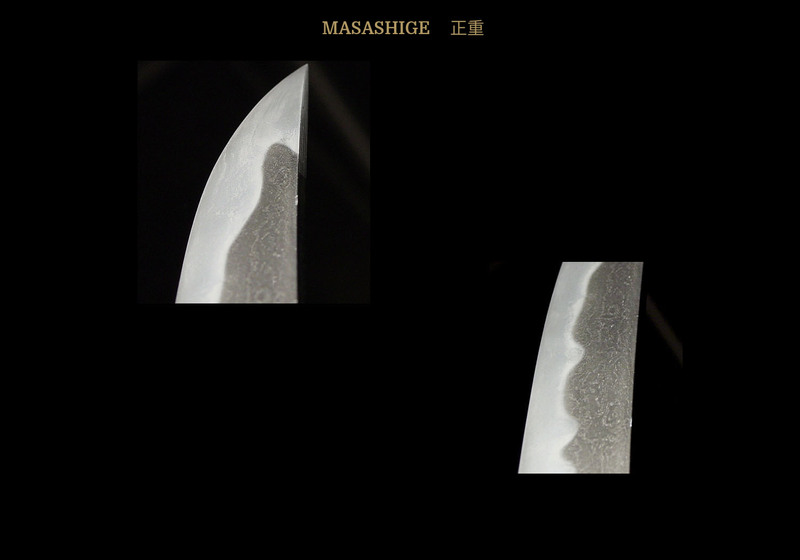 Finally, Ieyasu (家康) himself also cut his hand on a ko-gatana made by Muramasa (村正). Thus it is fairly easy to understand that, as far as the Tokugawa family was concerned, the swords of Muramasa (村正) were evil and should be shunned and avoided at all costs. Further, during the Edo Jidai when the Tokugawa Ke was all powerful, it is not unreasonable that the story of Muramasa (村正) swords being evil became popular. This was truly very unfortunate for Muramasa (村正). His swords became political tools. They were avoided and spurned by the Tokugawa and all daimyô seeking their favor. Conversely, among the daimyô and military families who harbored animosity towards the Tokugawa Ke, there was a tendency for them to like and keep swords made by Muramasa (村正). It is said that this began with the families that had deep feelings for the Toyotomi Ke such as the Sanada, Fukushima, and such. Later, during the Bakamatsu era, it included the patriots of the Satsuma, and Chôshû clans and others. 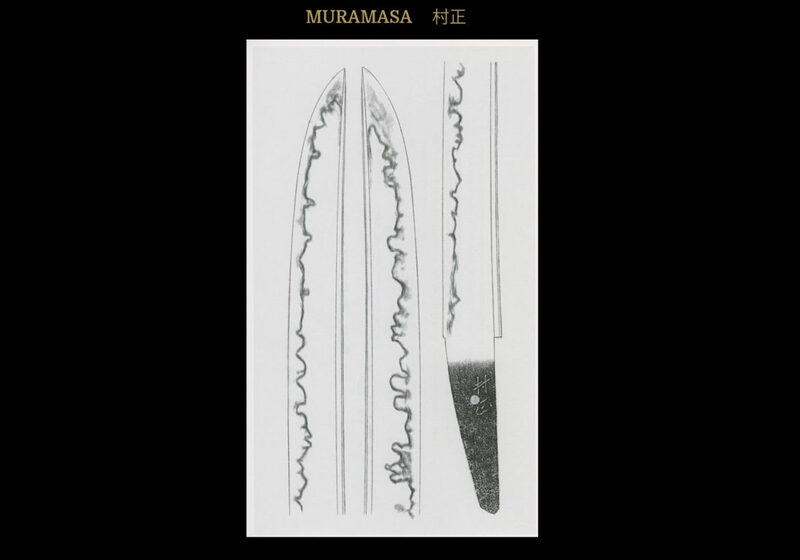 However, in reality, the reputation of the swords made by Muramasa (村正) for being exceptionally sharp is an actual fact. The yakiba epitomizes keenness, combined with a clarity of the ji and the ha. These factors may in themselves have added fuel to the stories about them being evil swords. They were said to cry out in the night for blood, driving the owner to murder. The historical facts about Muramasa (村正) himself are somewhat muddied. Some old books place him around the Enbun or Jôji eras (1356-1368) of the Nanbokuchô Jidai. There are even some that link him to Masamune (正宗) as a student. However, modern sword scholars have long since swept away these ideas and correctly placed him beginning work around the Bunki era (1501-1504) as this is the oldest dated work found by him to date. This would make him the second generation of smiths by this name. When studying the roots and dates of origin of swords by Muramasa (村正), we must consider more than just the dated example mentioned above. We must also consider that since Ise where he worked had no notable smiths before him and few after him, he must have learned his craft somewhere. The fact is that the sugata, and especially the “tango bara” shape of the nakago, that became the special traits of Muramasa (村正), are remarkably similar with the kaji of Bushû Shitahara, the Sôshû school, and the Shimada Kei of Suruga. These are lines along the same road and this is an interesting possible interaction when merits further study in the future. Obviously, when we are studying the history and development of a smith and trying to pin down his actual working dates, etc. signed and dated examples are invaluable. 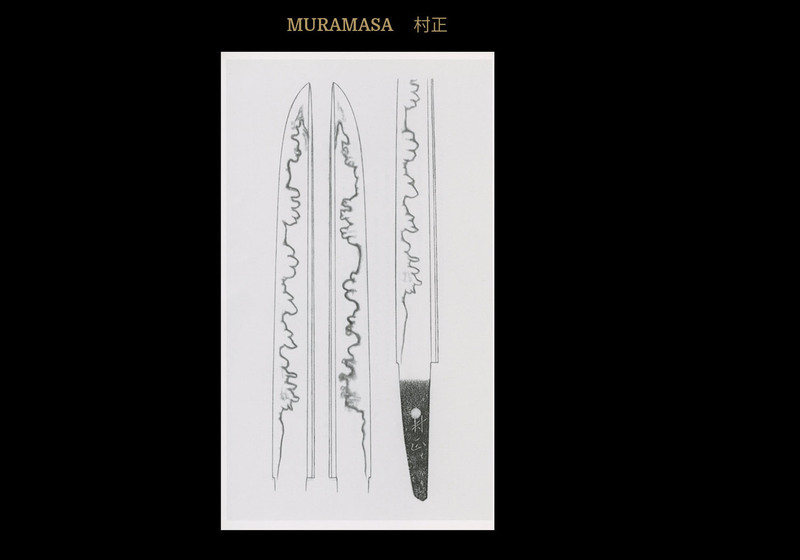 While we do have the signed example of Muramasa’s (村正) work dated in the Bunki era, and some others, finding examples is somewhat hampered as an indirect result of his reputation for “evil” swords. Because of the fact that swords by Muramasa (村正) were looked upon unfavorably by the ruling Tokugawa family, many were defaced and had their signatures obliterated or changed. There are some in which the kanji for Masa (正) was changed to (忠) making the mei read Muratada (村忠). In other cases, it was either partially obliterated or obliterated altogether. This practice, of course, also opens up the door for the less scrupulous to try to pass of gimei swords as Muramasa swords that have had their mei changed. SUGATA: The sugata will be in accordance with the period of manufacture. In other words, with katana there will be a somewhat shallow sori with saki sori present. With tantô there will be some saki sori or no sori in most cases. The shinogi will be somewhat high and there will be little hira-niku. The kissaki will be slightly stretched. 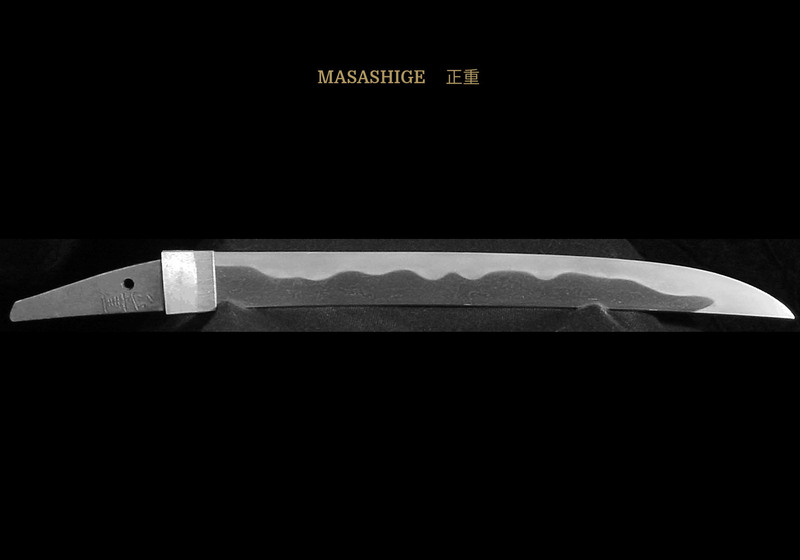 Mitsu mune will be the most common and katana, ko-wakizashi, and tantô will all give the impression of sharpness. JITETSU: The kitae will show a marked resemblance to that of the Sue-Seki works of the Mino school. A slight difference will be that the kitae of the Sengo school is not as whitish as the Sue-Seki’s. Generally, it will be mixed with mokume forming a partially straight grain. The ji will have an abundance of nie containing chikei and jifu. Often yubashiri will be found. HAMON: The hamon will be nioi deki with clumps of nie. 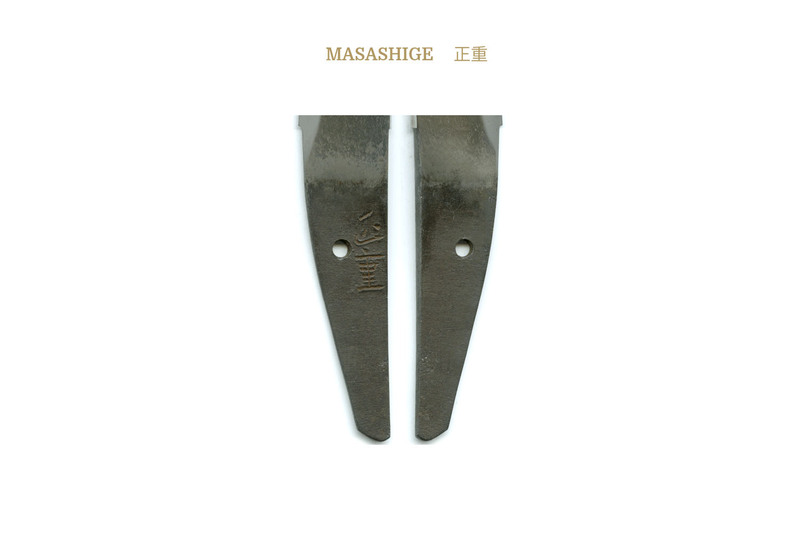 There are combinations of notare, notare midare, ô-midare, gunome-togari, areas of sanbon sugi, hako midare, etc. 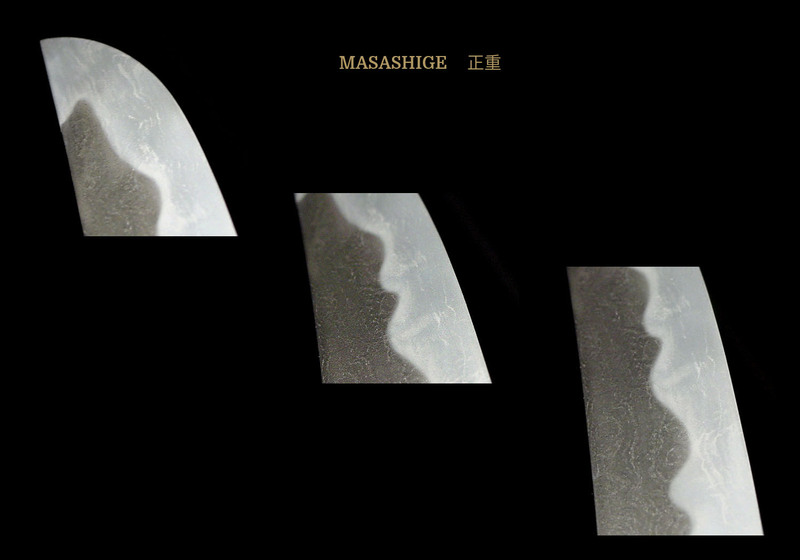 All of them are extremely exaggerated, characteristics that are in the tani (valleys) of the midare press close to the ha saki (edge), there are some that appear to leave the blade, and the tani between the midare become notare. 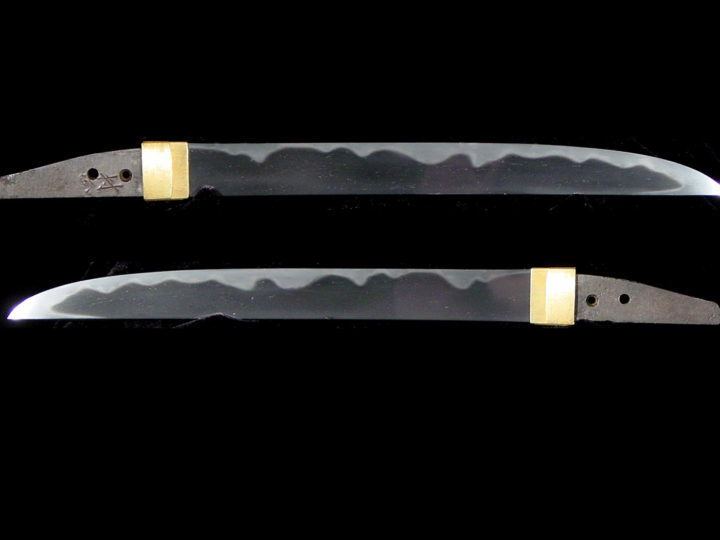 When sanbon sugi appears, it is in specific areas and does not encompass the entire blade as with the Mino den. 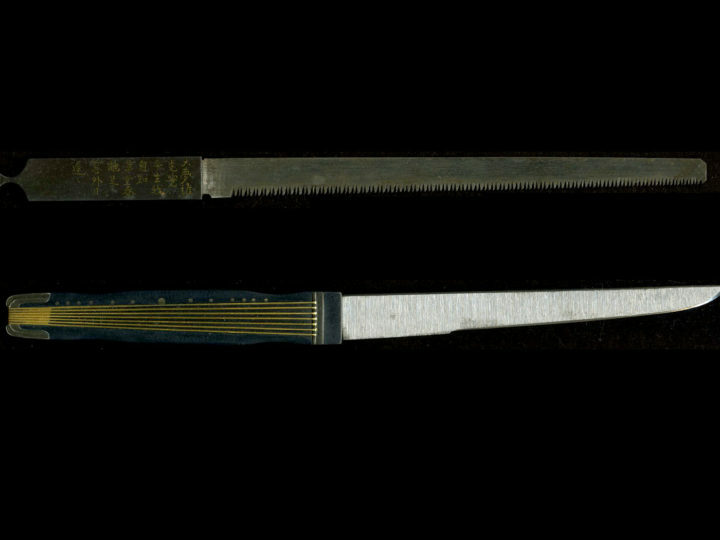 A key kantei point for this school is that the hamon will be the same on both sides of the blade. Another key kantei point for Muramasa is a squarish koshiba that is often seen in his works, even if they are gunome or sanbon sugi. Sunagashi and kinsuji will be found. The yakidashi starts near the machi. BÔSHI: Often we find a jizô bôshi with a long kaeri reminiscent of the Mino school. There will be midare in the kaeri, often togari. Others will be kaen with hakikake. NAKAGO: The nakago will have the distinctive tanago bara or “fish belly” shape with a sharp tapering to form a iriyama-gata. This is particularly pronounced in tantô. The yasurime are usually kiri. Occasionally a very slight katte-sagari slant will be found. MEI: Signatures are generally ni-ji mei (two characters). The ni-ji mei will be deeply cut and done in thick, semi-cursive chisel cuts. One of the top student of the Muramasa Kei was Sengo Masashige (千五正重). He was the son the sandai Muramasa (三代村正) and initially he was called the fourth generation Muramasa (四代村正). He later changed his name to Masashige (正重) and seems to have flourished from around Tenshô (1573-1592) to Kanei (1624-1644). One can only wonder if his name change had anything to do with the evil reputation of the name Muramasa (村正). His workmanship was like that of Muramasa (村正) but the sugata of his katana seems to be a little weak. 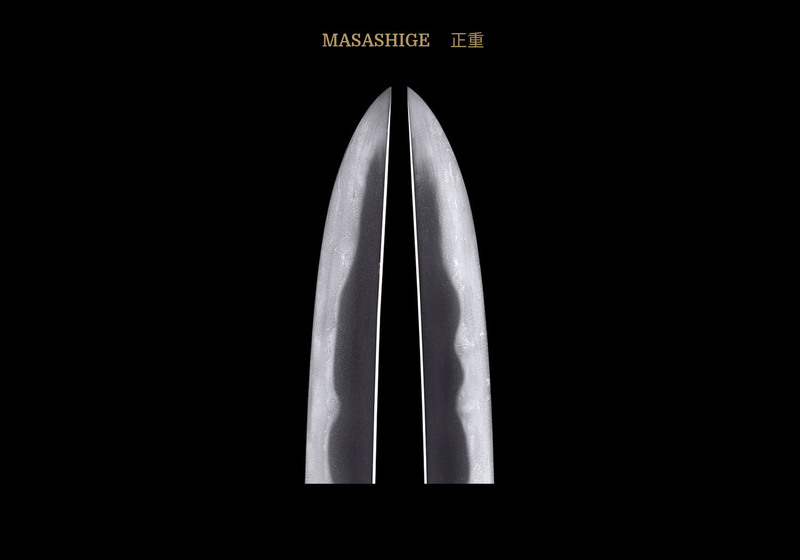 Generally Masashige’s (正重) wakizashi and tantô will be larger and the sakizori more pronounced than the works of Muramasa (村正). As for tantô, sun-nobi are the most common, the sori is strong, and the kasane is thick. As one would expect, the quality of his works do not reach the level of quality of the Nidai Muramasa (二代村正) whose works he emulated. His nakago is a strong tanago bara and his mei has a deep tagane and are ni-ji mei. The influence of the Sôshû school is more evident in his works than in the works of the Nidai. The blade shown below is an excellent example of his work.